35 th National Games of India which was held at various venues across Kerala came to an end on Saturday the February 14,2014. The games was inaugurated on January 31 2015. Candidates from all Indian states, Union Territories and Services participated in the games. 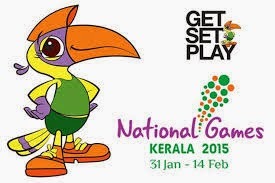 Great Indian Hornbill, the state bird of Kerala, was the official Mascot of the 35th National Games. President of India had congratulated State for successful conduct of Games. The Indian Olympic Association (IOA) has termed Kerala 2015 the best Games ever. The Opening and Closing ceremonies of the 35th National Games were at the newly built Greenfield Stadium at Karyavattom on 31st January and 14th February, 2015 respectively. The games were held from Feb 1 till Feb 13, 2015.